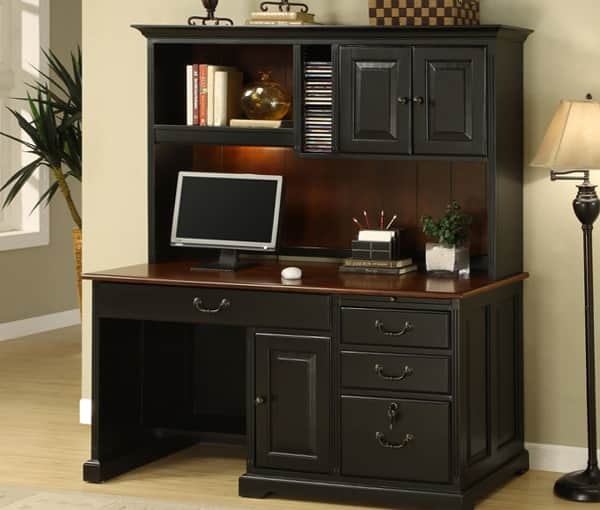 Worried about how to choose a convenient, compact and stylish computer desk that perfectly fits into the interior design of your house? We offer you photos of the 10 best solutions with different models of tables – classic, angular, with racks and settings – and their combination in modern interiors. 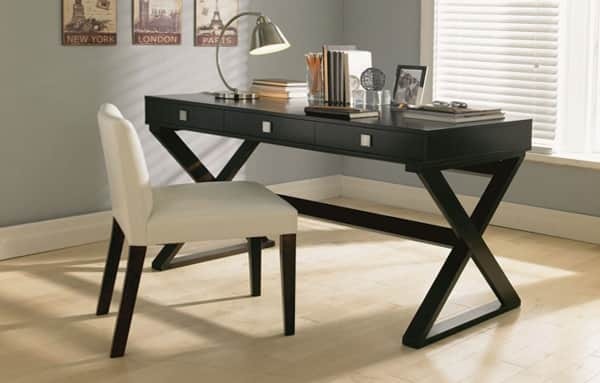 Whichever model of the table you choose, the main thing to consider is the correct size and proportions of the table, especially if it is a question of buying a study table. Choosing the right table and chair will ensure a correct fit, which means a healthy posture, eliminating unnecessary problems with the back and vision. 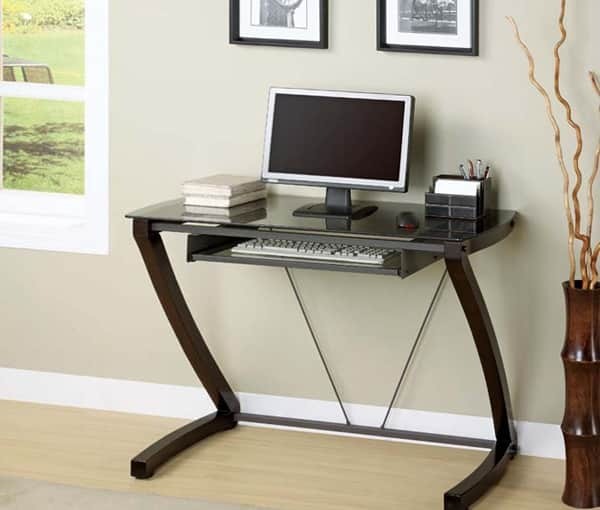 Here are the necessary recommendations for choosing a computer table. The ideal height of the table – when in the right sitting position, the edge of the table top falls on the solar plexus. 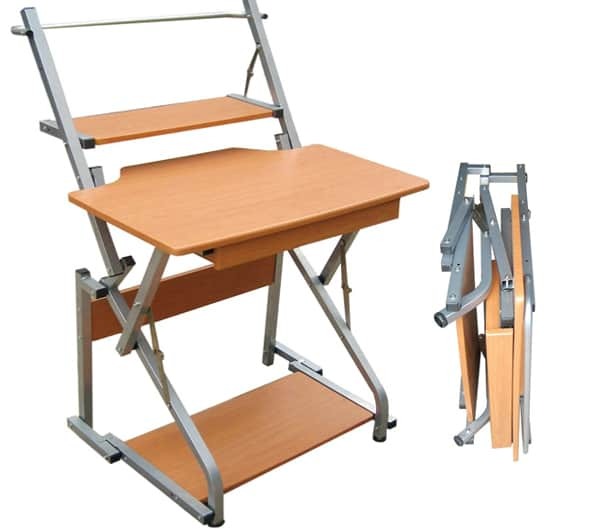 Of course, it is optimal if the height of the table is adjustable, so the table will suit both you and your family members, and the problem with a fast-growing child will be solved, so you don’t have to buy a new table often. For the correct posture and position of the hands, the elbows should not hang from the table. For a child, this is a minimum table length of 60 cm, whereas for an adult, it is from 80 cm. 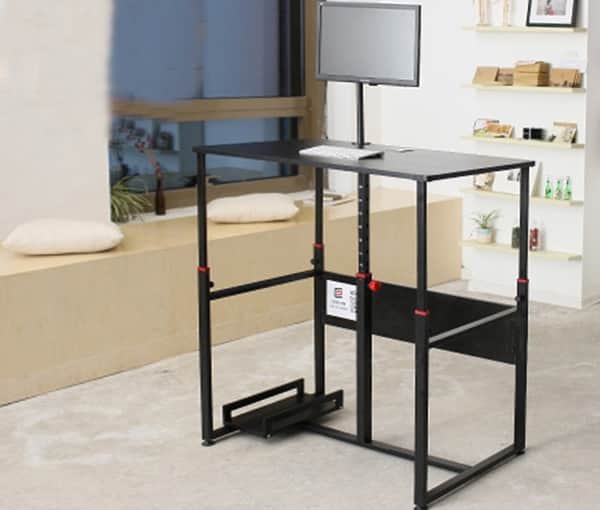 The width of the table top should allow for a sufficient safe distance for the monitor to be placed (approximately 70 cm) and leave space for all the necessary items in the workplace – papers, books, office items etc. 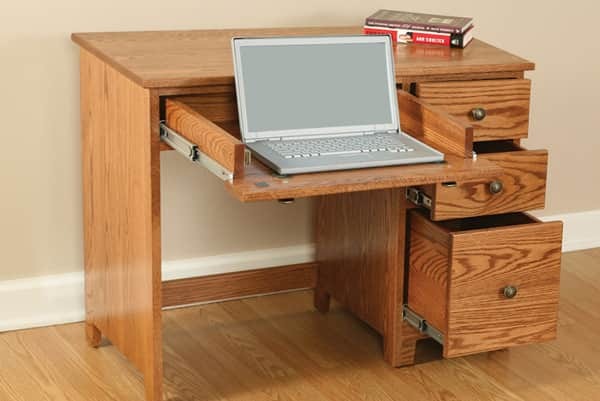 If there is no sliding panel for the keyboard, it is worth taking into account the space for it. Under the countertop, there should also be a comfortable distance for the feet (15-20 cm from the table top to the knees). Be careful with partitions, shelves and table tops. They should not block natural light. 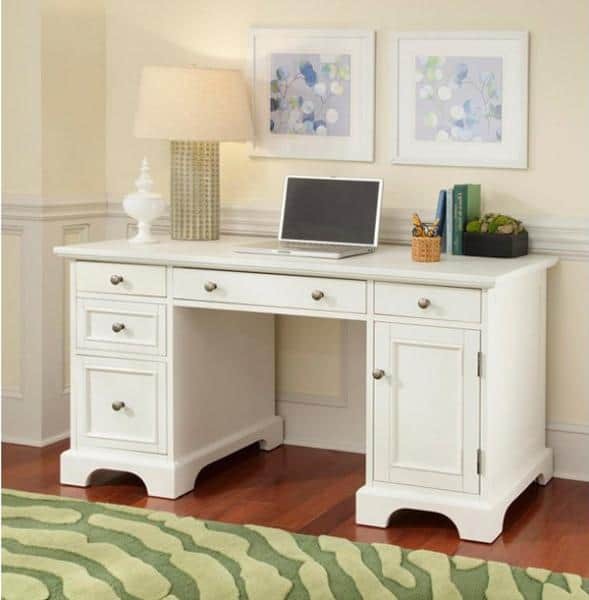 There must necessarily be room for lamps and a table lamp to ensure normal lighting in the dark. The chair should be comfortable and ergonomic. 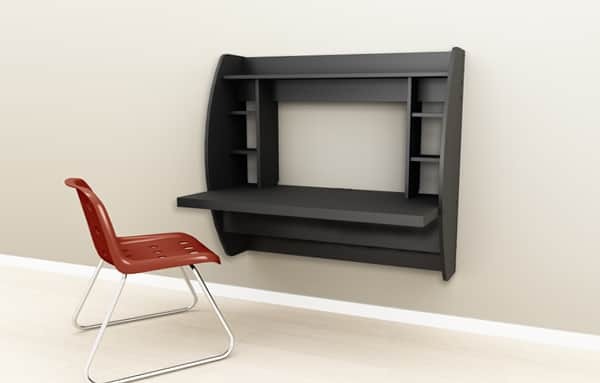 Its height should be adjusted and allow to place the feet on the floor at the right angle. The back should replicate the anatomical edge of the human back and end in the middle of the shoulder blades. Armrests, however, are not recommended, especially for children’s armchairs. This can lead to an uneven distribution of the load on the back. 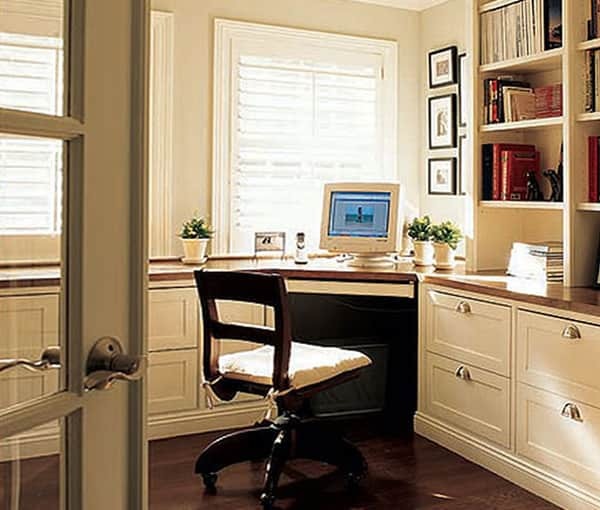 First, it is an opportunity to use the corners, which, as a rule, are not occupied with furniture, which means that you can save a lot of space in the room. Secondly, it is convenient to use the angle near the window with it, without obstructing the light or blocking the approach to the window, which means, providing a sufficient amount of natural light. 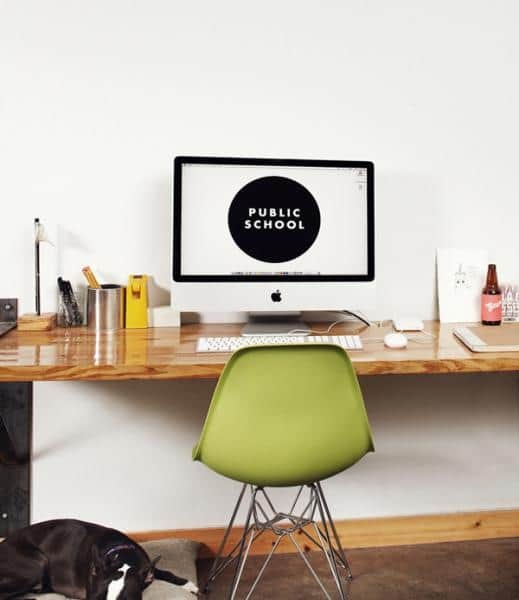 Thirdly, the corner table looks very organic with all sorts of shelves, superstructures and shelves, which makes it possible to optimally equip the workplace without resorting to excess furniture. 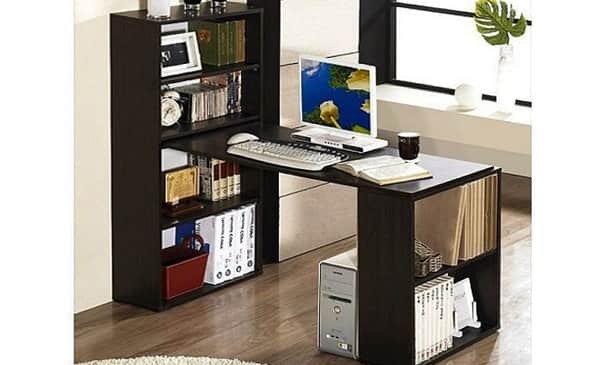 Fourthly, the design of the corner table usually provides a sliding panel for the keyboard, so you can comfortably sit with the papers without moving the mouse and keyboard. 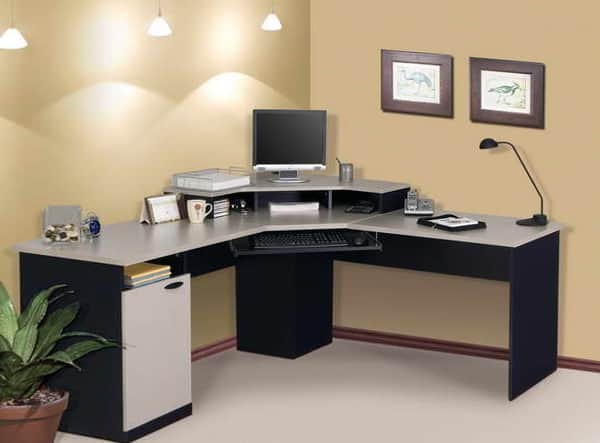 When choosing a corner computer desk, pay attention to its form – whether it is left-sided or right-sided, elongated to the right or left? From this, you can decide which wall the table will stand against. The same applies to shelving and superstructures. Make sure that in the place where the table stands, there is no lighting. Please note, if you have chosen a table with a tabletop extended in one direction, you are unlikely to be able to change the wall, from which it will initially stand against. 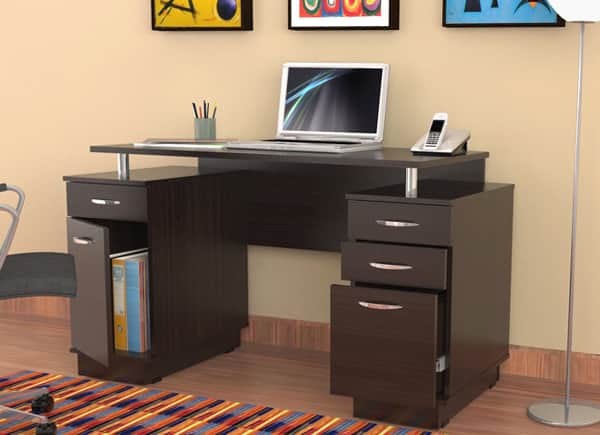 Therefore, if you like permutations, it is better to look at another option, for example, a rectangular table with drawers and a curbstone. 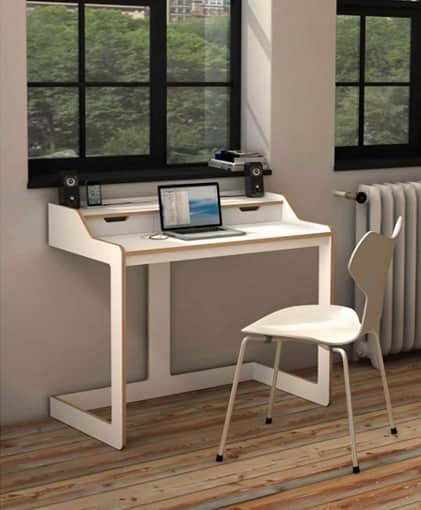 Such a table, if it only uses storage space under the countertop, is very convenient to put near the window. 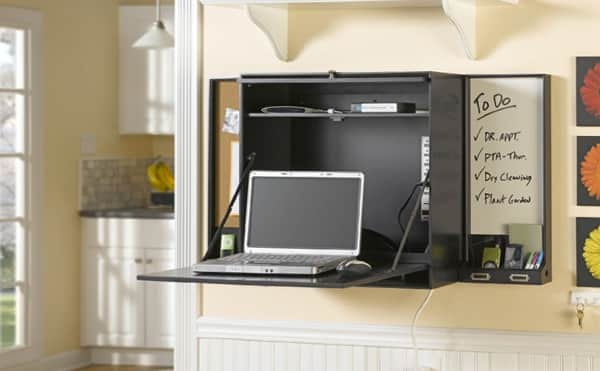 If you also have an add-on or a rack, however, you have to put it against the wall. 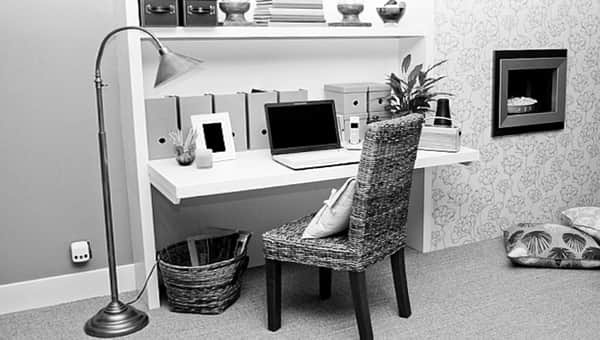 In the first case, boxes and curbstones will allow storing only a limited number of the most necessary work items, papers and office necessities, so, most likely, you will also have to buy a small closet, for extra items like books. 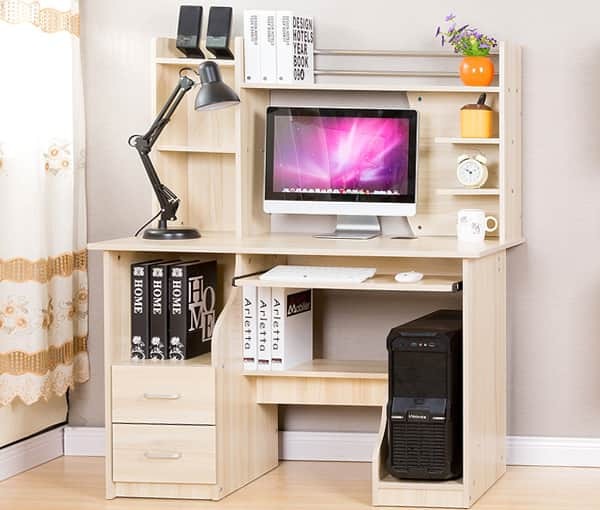 In such models, there is also rarely a place for a system unit, which is not entirely convenient if you are using a desktop computer. 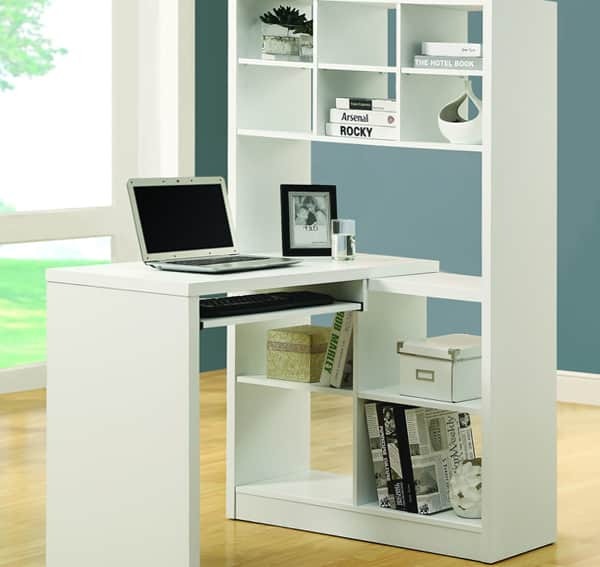 Therefore, such a table is more suitable for writing and for small storage. 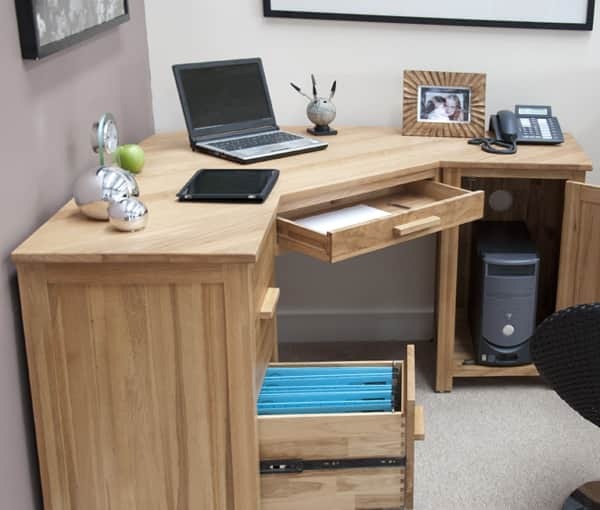 This is a convenient piece of furniture that combines both the workplace and storage space. 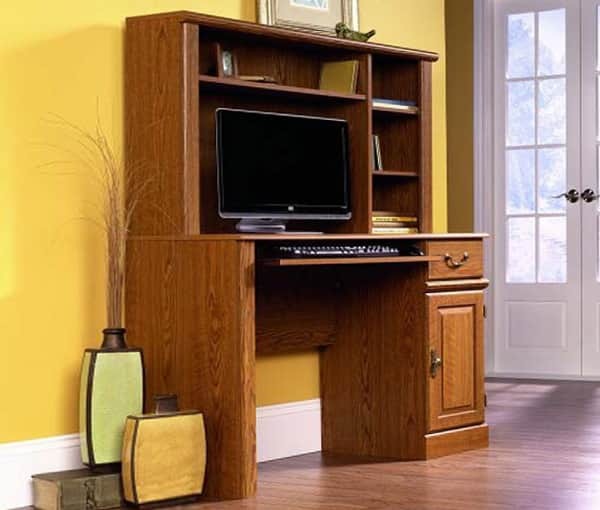 It is the best option for small rooms , especially if the table is made by an angle (one side is a table and the other is a rack). 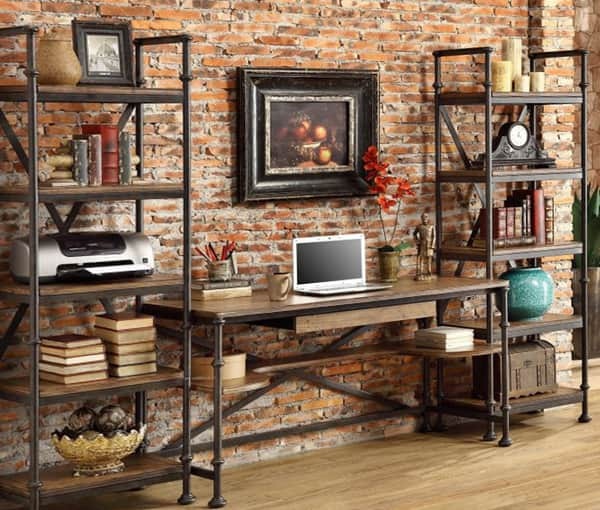 A table with shelving allows you to keep everything you need to work right at your disposal. 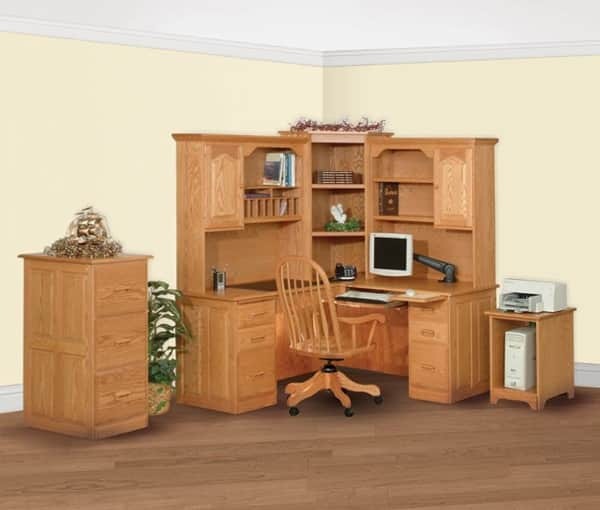 The number of shelves and add-ins will depend on how many computer accessories and accessories you plan to place in the table. Choose a table for your convenience. Perhaps, even a footrest under the table will be useful for you. 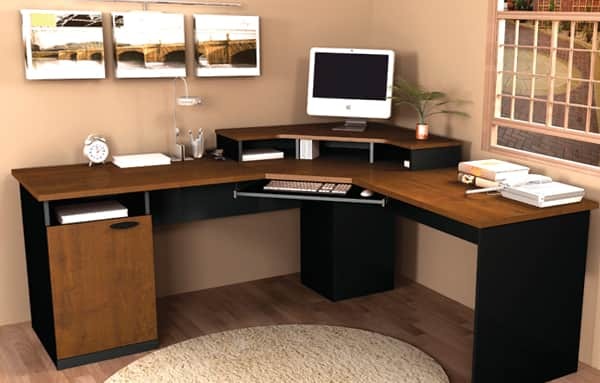 In such models, because of the large number of superstructures above the table, there are often problems with the neat arrangement of the wiring, so it is very important that the superstructures take into account the holes for the optimal connection of the wires from the monitor, mouse and keyboard. 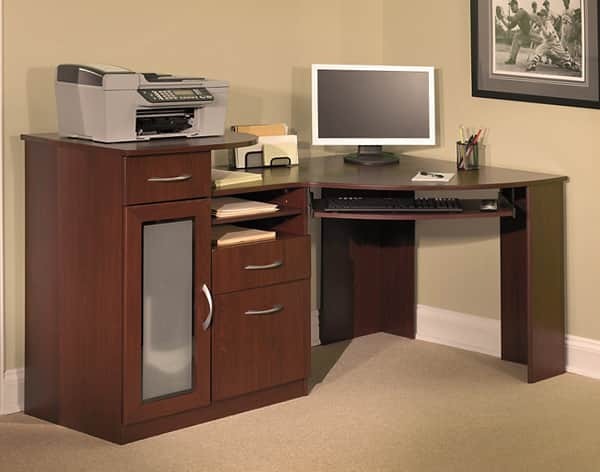 This also ensures that it is convenient and safe and no electrical problems can arise. 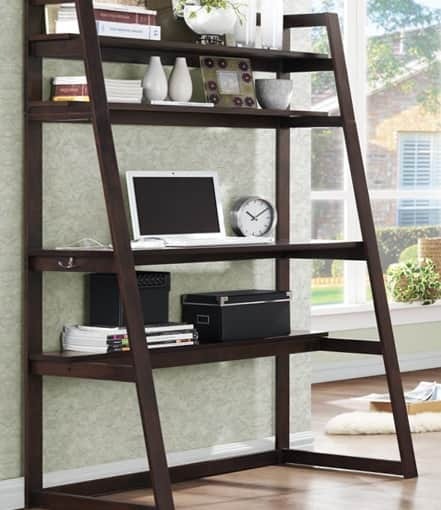 Like a table with a shelf, this type of table allows you to keep all the necessary items at hand. When buying, try to sit up straight at the countertop and reach out to all the necessary panels. If this works out easily, without having to get up from the chair, the right specimen is in front of you! 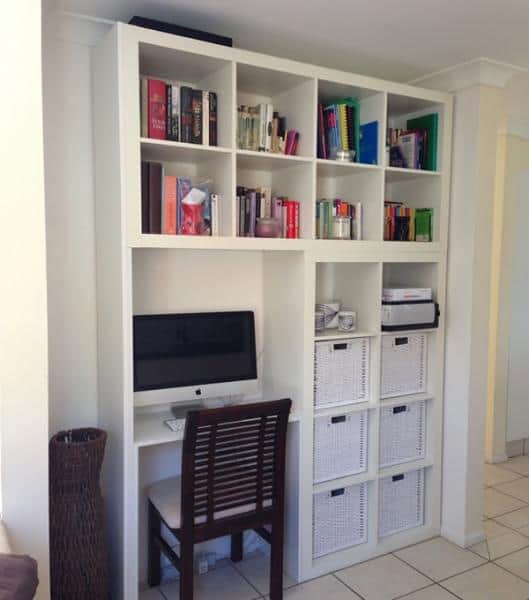 Another interesting idea is to save space in the room. 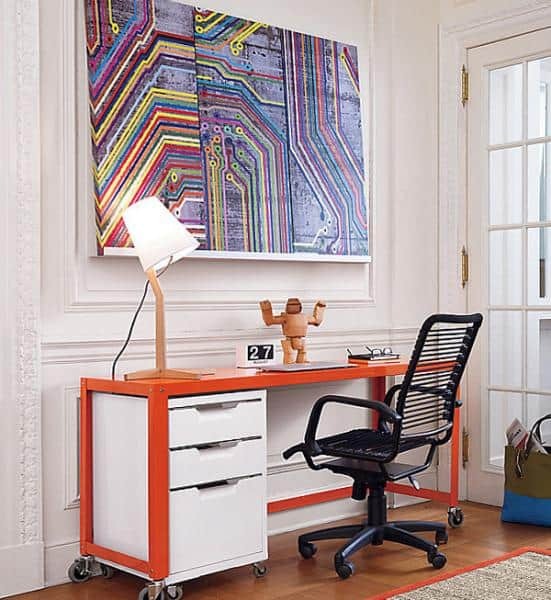 The transformer table assumes a convenient retractable design of all table elements – countertops, keyboard stands and space for computer accessories, bedside tables and drawers. 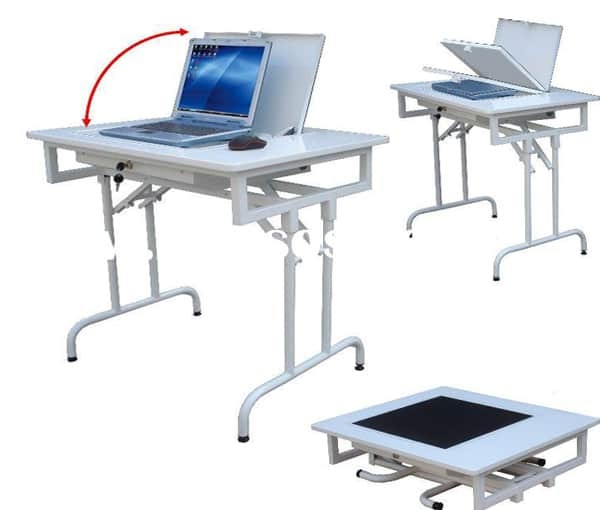 The transformer table is a convenient solution for creating a double workplace, for example, for two schoolchildren. 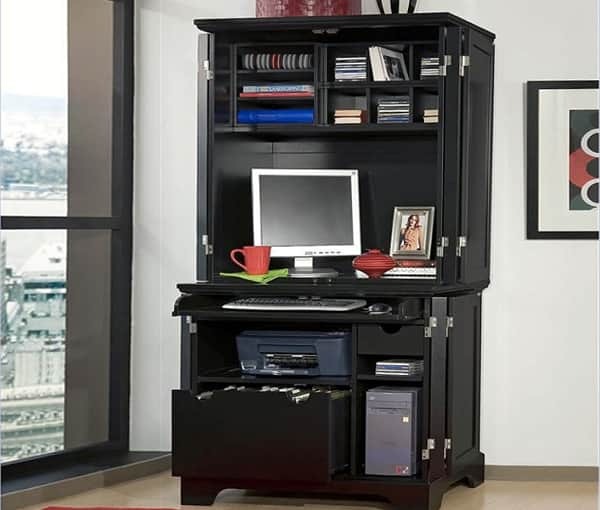 It is also an optimal way to combine a computer and a desk , using a sliding panel for writing. 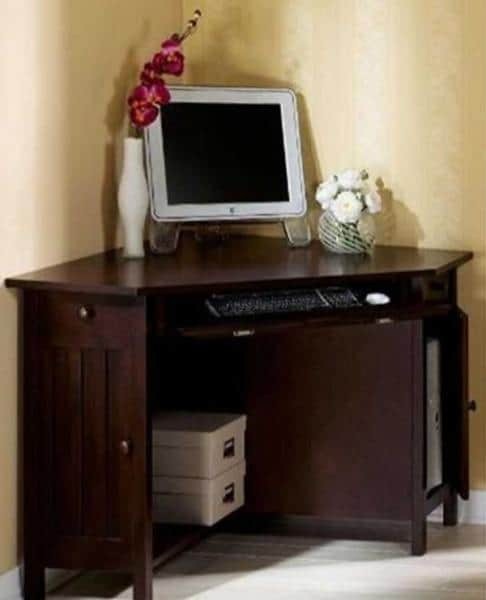 The choice of material for computer desks is not very restricted. Most often the materials are different varieties of wooden surfaces – an array of wood, MDF or chipboard. Choices depend not only how long the table will serve you, but how safe it will be as well. We will analyze everything in order. 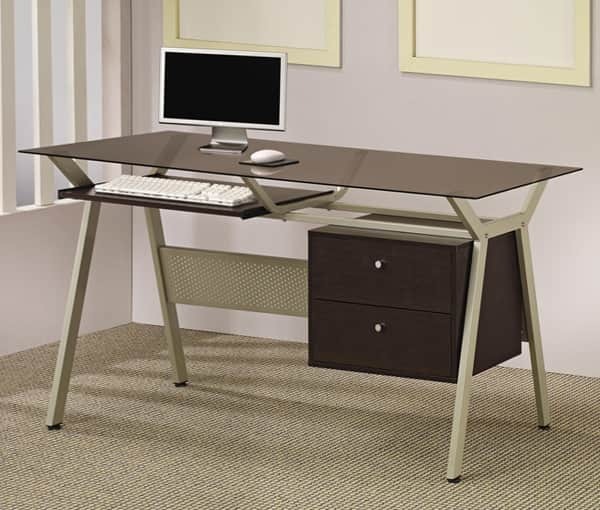 The table from solid wood is the most durable, reliable and safe. Accordingly, its price is quite high, but this is justified by a long service life.And, of course, a table made from natural wood looks very rich in the interior. The MDF table is slightly inferior to tables made from natural wood, in terms of properties, but it saves your budget considerably.Therefore, if the funds for buying are limited, the table from MDF will be a good alternative. The table from the chipboard, in most cases is very cheap, but it has long been proven that with time, the EAF begins to emit toxic fumes, which can negatively affect your health and even cause poisoning. 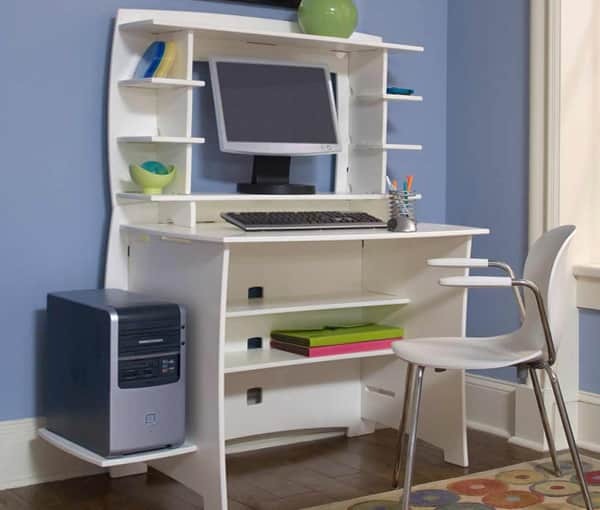 Therefore, if you decide to purchase a computer desk, especially for a child, save money for a safer MDF or choose a plastic table, which you can obtain at a similar cost. 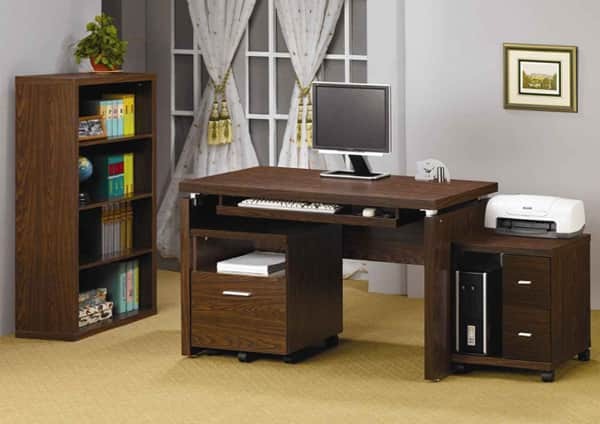 To the indisputable advantages of wooden computer desks it is necessary to include a huge variety of their colors – from natural woody tones of both light and dark colors, as well as various variants of wood coloring. The main factor to consider when buying is the materials from which the table is made, as well ensuring the paints and varnishes with which it is coated are non-toxic and have all the necessary documents on certification and quality. 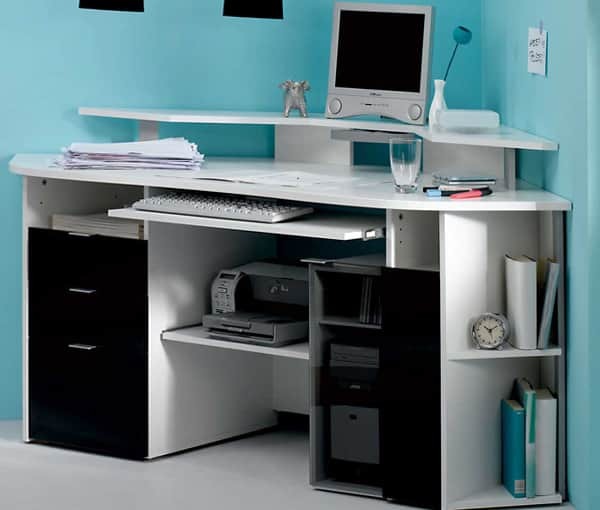 This is a very original solution to the organization of the working space, often used in Ikea. Glass in the interior has one undeniable plus – it looks weightless. 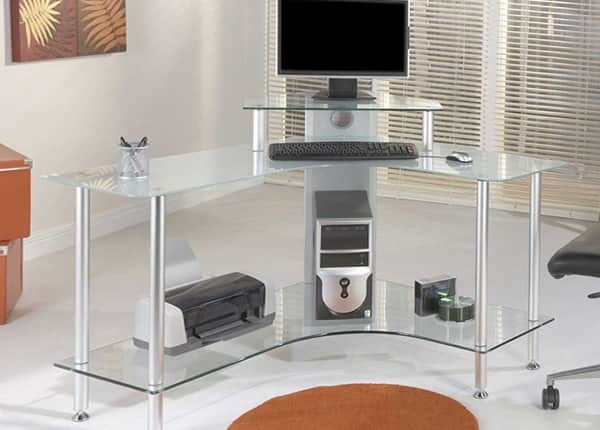 Therefore, the glass table in any modern interior will look natural and at ease. An issue that might arise is that this is not a very practical and safe acquisition, especially if the table is bought for a student. This is because glass is a rather fragile material and requires extremely careful handling and special care for the countertop, which, despite the sufficient strength of modern materials, has the property of scratching and reflecting the stains on the surface. So before you buy a glass table, think carefully about the pros and cons of such an acquisition. The shortcomings include low durability and susceptibility to scratches and other mechanical damages. If you are however choosing a table for a growing child, and want a model to last you more than 3-4 years, then the plastic table will be the best choice. It would seem unlikely that such an unpopular material for the table as metal, is often found in the market. 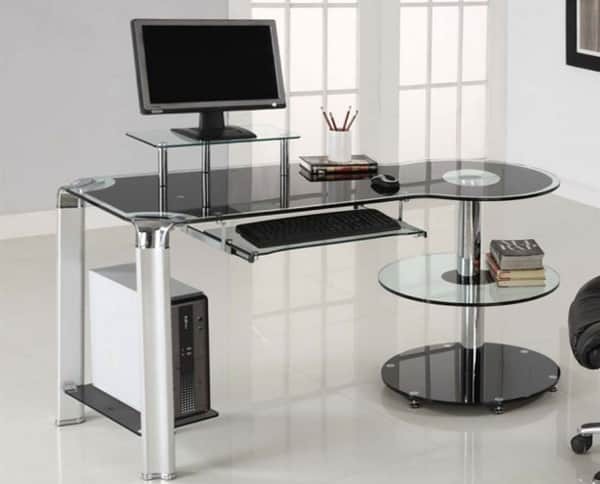 Metal computer tables are not completely made of metal. 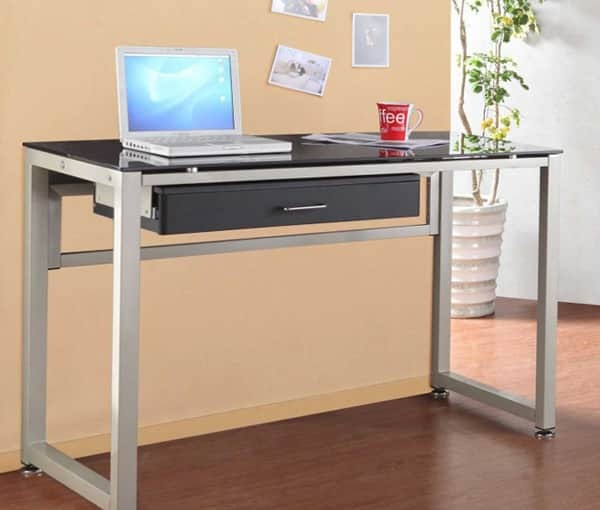 The table top, as a rule, is wooden, and legs and edging – aluminum or stainless steel. 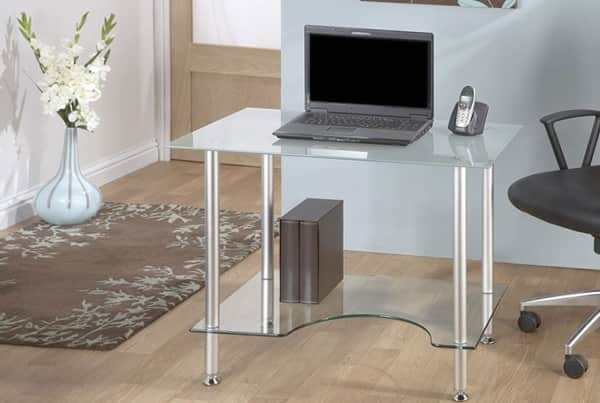 A feature of metal tables is that they are not suitable for all interiors, often not even for home, but for office space. 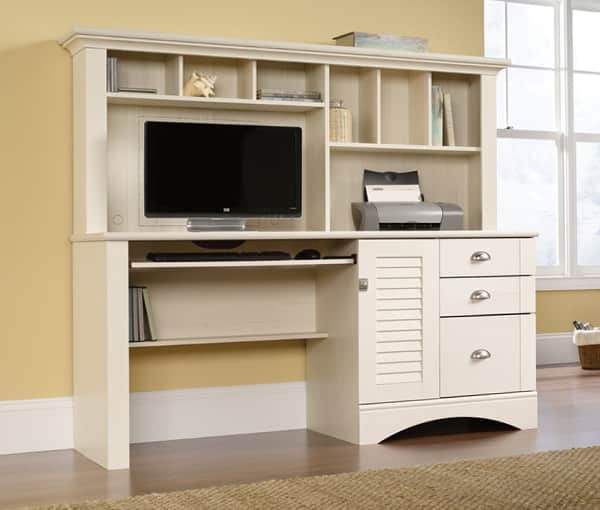 Ideal design styles for such a piece of furniture are high-tech or loft . 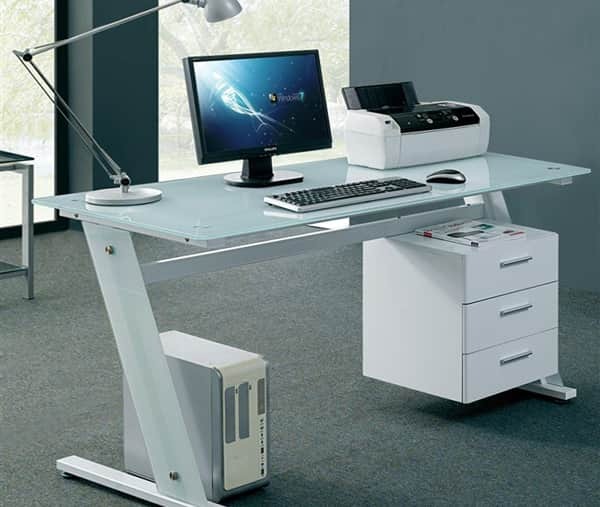 Among the advantages is the longevity, strength and reliability of such tables. In addition, they are very diverse and original. Examples are in the photos below. The drawbacks – low durability in the areas of connection of wood and metal (the tree can crumble during assembly and disassembly).